By far our favorite excursion! By far our favorite excursion! Holding puppies always makes for a good day! The dog sledding camp (no snow though) was fun but wish it had been with snow. The dog sledding camp (no snow though) was fun but wish it had been with snow. Very informational. Dogs were being trained for real dog sled race. Also got to pet the puppies. Cute! This was a fun excursion that let us learn about dog sledding, meet the dogs, play with the puppies, go in to a room that was 40 below zero and do gold panning. The Folks at the Gold Rush Dog Team were great and very informative. Spent a lot of time driving. Alaska 360: Learned about the ididarod and what goes into caring for the dogs during a race. Alaska 360: Learned about the ididarod and what goes into caring for the dogs during a race. Got to meet and interact with the adult dogs and pet some one-week-old puppies! The man who presented was incredibly informative and hilarious! So fun seeing the dogs, petting, them, seeing the equipment used. This was a great experience. The information part at the end felt a bit rushed. Loved cuddling the puppies! Sled ride was awesome and got to play with the pups for awhile. Loved the fact that the money we did pay goes to help these mushers fund their passion. 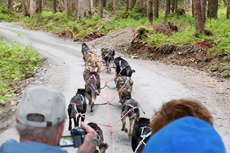 Loved the fact that the money we did pay goes to help these mushers fund their passion. Loved holding the puppies. The tour was very well run and very professional. One of our best tours on our cruise. Mushers dog sledding was excellent! Mushers dog sledding was excellent! Who doesn&apos;t love hanging out with dogs and puppies for an afternoon? Musher&apos;s Camp / s&apos;mores. Cool experience in amazingly beautiful location. Great guides, lectures, history, etc. Kids got to hold sled dog puppies. Loved it. Emerald Lake was not to be missed, Heidi was a wonderful tour guide, Bears, Grean Lakes, amazing!!!!! Mushers camp and sled dog discovery. Enjoyed the helicopter viewing of the landscape to the dog camp. this came with the white pass scenic railway. this came with the white pass scenic railway. at the end of a very long bus ride you got lunch and the chance to dog sled on their summer sleds. Our kids didn&apos;t do this as it was an extra 35.00 per person. A great time to see how the dogs train, hear about the Iditarod, and get to spend time with the puppies. The dogs were excited and raring to go. A all-around great experience. You get up close and personal with the dogs; learn a great deal about the dogs and mushing and you get to see and hold puppies.